Luxury, elegance, intimacy, breathtaking views of the caldera, Alexander's Boutique hotel is consisting of six fully self-contained cave villas. All the comforts of home, with the luxury of five star amenities, in an environment of superior accommodation. Alexander's Boutique Hotel welcomes you into a "home away from home" and you can settle on the terrace, enjoy the view of the Aegean Sea, the village and some of the world's most amazing sunsets. Alexander will pamper you in style, while you enjoy the generous hospitality of the staff. When you arrive, you can get off in front of the main entrance. There is a parking lot where you can park your car about 30 metres (1/2 Block) away.Alexander's Boutique hotel is located at the top level of the caldera on the main road and it takes only 8 steps down to get to your villa. 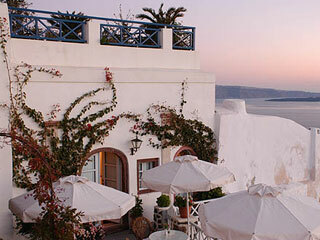 Alexander's Boutique Hotel is in the village of Ia, recognised as the jewel of Santorini. Alexander's Boutique hotel has been experiencing tremendous success, and we would like to thank all of our guests for helping Alexander’s Boutique Hotel become one of the most sought-after destinations for those vacationing in Santorini. Due to the great demand the hotel has been experiencing, we have expanded our hotel to include eight more traditional cavehouses to our complex. Introducing the Topaz, the Pearl, the Opal, the Citrine, the Deluxe, Superior & Junior Suites. These traditional cave houses are maintained according to the Cyclades style of architecture, creating a cosy atmosphere that harmoniously blends into the simplicity and beauty of the island.Located adjacent to Alexander’s Boutique Hotel, the complex offers guests a 180 degrees view of the caldera that overlooks the ocean. With white walls and antique furniture, we have created a serene atmosphere that many guests have called the definitive Santorini experience. Emerald Villa has a combined living/bedroom, which allows you to relax in a King size bed while you enjoy your favourite movie. We have maintained in this villa, the original wine vat, used for crushing the local grapes and the wine barrels were stored here until needed. This villa has a separate kitchen / dining area to allow for that intimate dinner for two. The bathroom, once again has a white marble floor, but with green granite around the jaccuzi bath and hand basin, which gave it its' name. Each villa has been created in the traditional cave style and is individually decorated with antiques from the private collection of the owner, which includes hand made carpets. Neutral colours have been used to decorate the bedrooms and living rooms, to allow the charm of the furniture to shine and provide a feeling of elegance, which we believe is essential. Our Diamond Villa has two double bedrooms with both King & Queen size beds that can allow privacy, by closing the traditionally fitted doors and windows. These are divided from a large living room with a 33 " Sony TV, Home Cinema, Sony stereo/CD system. A separate, fully equipped kitchen comes complete with a microwave, coffee maker, mini bar and 5 burner, electric touchpad hotplates. The bathroom boasts a white marble floor with black granite trims around the Jacuzzi bath and hand basin. Sapphire is the name for our third villa, because the bathroom comes alive with the very rare blue granite which graces the vanity and Jacuzzi bath. The bed is queen size. You can be assured of privacy, while you enjoy the views of the Caldera and the surrounding village of Oia. The combined kitchen / living room can remain private from the bedroom, by closing the traditionally fitted doors and windows that divide the two areas. Each villa exudes comfort and style to guarantee a memorable break from your routine. The bathrooms feature a different colour of granite to compliment the white marble floors and Grohe fittings guarantee a pressure shower, to ensure that you relax. If however, you would prefer to soak away the remains of your day, why not slip into the Jacuzzi bath with a bottle of bubbly.